Be the first to share your favorite memory, photo or story of John "Johnny". This memorial page is dedicated for family, friends and future generations to celebrate the life of their loved one. John “Johnny” Harvey Ackerman, Sr. passed away peacefully at his home on February 23, 2019, surrounded by family and friends. Johnny was born on January 27, 1948, to William Ellerbe Ackerman, Sr. and Bernice Olena Wilson Ackerman. Born and raised in Andrews, SC, Johnny graduated Williamsburg High School and farmed until his last days. He was a lifetime member of Earle United Methodist Church. He loved the outdoors and sitting on the banks of the Black River at Bark Landing, watching Nascar racing and Clemson football and socializing with family and friends. Johnny is survived by his wife of 40 years, Kay, and their children Kathy (Mark) McCutcheon, of Andrews, SC; and John “Jay” (Laura) Ackerman, Jr. and Kristy (Braden) Stoneburner, both of Columbia, SC. A beloved Papa, he leaves behind the lights of his life, his grandchildren: Josh, Kassidy, Olivia Grace, John Ellis, Eliza, Lawson, Blakely and Madison. He is also survived by his siblings: Gail Morris, Elaine (Darrell) Brown, and Wilson (Willa) Ackerman of Andrews, SC; and Ellerbe (Inga) Ackerman, of Kingstree, SC; and several nieces and nephews. In addition to his parents, Johnny was predeceased by his brother-in-law, Walker Morris. Funeral Services will be two o’clock Tuesday, February 26, 2019, at Earle United Methodist Church. Officiating will be the Rev. Arthur Vick and the Rev. Bob Huggins. Burial will follow in Harmony Cemetery. The Family will receive friends Monday evening February 25, 2019, at the Andrews Chapel of Mayer Funeral Home from six until eight o’clock. 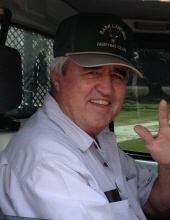 The family wishes to extend an invitation to all who knew and loved Johnny to join us after the service and burial to celebrate his life at his favorite place, Bark Landing Hunting Club. In lieu of flowers, memorials may be made to Earle United Methodist Church, 2180 Earle Rd, Andrews, SC 29510 or Harmony Cemetery Fund, c/o Mary S. Camlin, 697 Wheeler Rd, Andrews, SC 29510. Special thanks to Dr. Troy Gamble and the nurses and staff of Hospice Care of South Carolina who cared for Johnny and his family during his final days. To send flowers or a remembrance gift to the family of John "Johnny" Harvey Ackerman, please visit our Tribute Store. "Email Address" would like to share the life celebration of John "Johnny" Harvey Ackerman. Click on the "link" to go to share a favorite memory or leave a condolence message for the family.